We take great pride in celebrating the work of our successful self-publishing authors, and we do so each week through our Self-Publishing Author Spotlight. This week we highlight self-publishing author Kent Courtney, who has published four titles with Outskirts Press. From inspiring to educational and realistic, Kent brings his real-world experiences to readers through his works. Learn more about Kent through this week’s Self-Publishing Author Spotlight. Kent Courtney is an Arizona native, born and raised in Camp Verde. He has been a paramedic for over 25 years and an EMT before that. He has also worked in firefighting, technical rescue, and paramedicine in the mining industry, as well as having owned a training company. Kent enjoys writing historical fiction and weaves his love for Arizona history, especially the “old west” history throughout the pages of his books. Dealing with Dementia was co-written by Kent Courtney and his sister, Linda Callahan, who also resides in the Verde Valley of Arizona. The Fire Killer is dedicated to emergency personnel everywhere, and especially to the Granite Mountain Hot Shots who gave their lives protecting the lives and property of others on June 30th, 2013. As a Fire Investigator himself, with 30 years in the fire service, Kent makes this story relevant and realistic weaving real places and events imaginatively with a fictional and exciting storyline. Kent has been on the fire line and witnessed the devastation that fire brings to the forest and to the lives of the people who live there. In the mid-1700s, anyone who wanted to embrace the promise of the New World had to face leaving everything familiar behind, as well as enduring months of dangerous sea travel. Banister—The New World is an epic historical novel about Elizabeth and James, a young Irish-English couple who find the courage to travel to the American colonies. They take a Spanish ship into the unknown, with faith that they can make their way together. But fate has triumphs, tragedies, and adventures in store for them that they could never have imagined. Banister—The New World takes place against the gritty, thrilling backdrop of King George’s War and the early French and Indian Wars, putting James and Elizabeth among a cast of characters ranging from Benjamin Franklin to an Iroquois tribe, and throwing challenges at them that range from learning to live off the land to fending off Indian attacks. This gripping, richly written novel is a journey that will stay with you long after the final page is turned. Threaded through the pages of Banister – The New World there is a beautiful love story, exciting adventure, and an incredible story of survival, struggles for peace, and stories of wars that formed the great country we live in. Learn what it takes to be an exceptional emergency medical technician and if the job is right for you and you are right for the job. Kent offers readers practical advice from an experienced EMT-Paramedic with real-life stories. The human being is an incredible miracle – body, mind, soul, and spirit. When it is broken or sick, some people accept the challenge, responsibility, and privilege to try to fix it in a compassionate and caring way. These people are exceptional individuals who dedicate themselves to step up and do a job that most people would never consider. This fun and exciting book is presented in a humorous way that keeps you turning the pages whether you are interested in being an EMT, just curious, or looking for an interesting and entertaining read. Climb into an ambulance, buckle your seatbelt, and hang on! The Courtney kids grew up knowing that their mother could do anything. After all, she’d proven it time and again. Growing up as a Missouri farm girl, she worked as a Rosie Riveter during World War II. She left Missouri for California, where she had four kids with her second husband, taking on the daunting task of raising them in forest camps while her husband worked for the forest service. After their divorce, she became a single mom with four children, working two jobs to pay the bills, and making sure they all graduated from high school. After her kids left home, she managed her own business. Nothing ever stopped her; there was no hurdle too high for her to jump, no problem too big for her to solve. But then dementia changed who she was, and her two younger children, Kent and Linda, watched their self-reliant, compassionate mother turn into a confused, and often bitter person. Written with Kent’s sister, Linda Callahan, Dealing with Dementia is a tribute to an extraordinary woman, and a deeply personal glimpse into the world of dementia caregiving. Kent and Linda give loving, practical advice for caregivers, based on what they’ve learned from their experiences. Dealing with Dementia is a beautiful love letter to an unforgettable mother, and a comforting resource for families and caregivers of dementia patients. 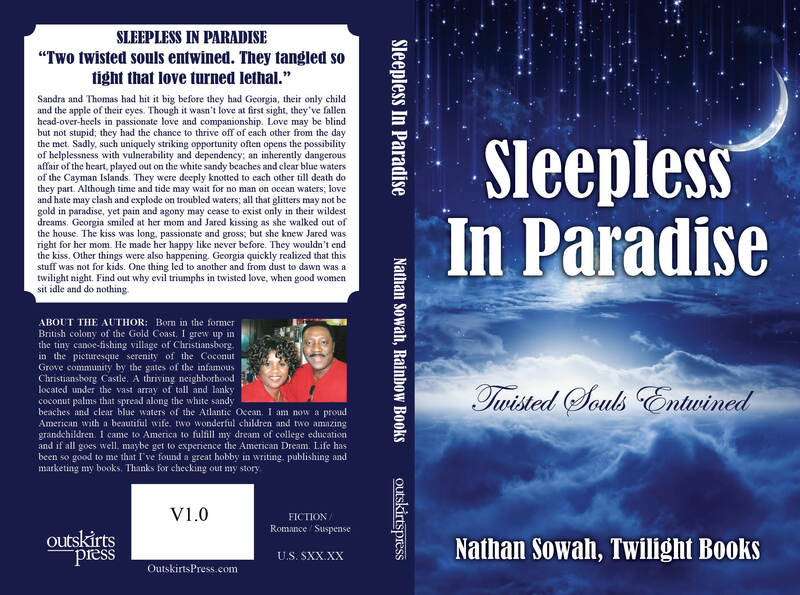 Nathan Sowah is self-publishing a book with Outskirts Press. And he wants your help deciding his book cover. Sandra and Thomas had hit it big before they had Georgia, their only child and the apple of their eyes. Though it wasn’t love at first sight, they’ve fallen head-over-heels in passionate love and companionship. Love may be blind but not stupid; they had the chance to thrive off of each other from the day they met. Sadly, such uniquely striking opportunity often opens the possibility of helplessness with vulnerability and dependency; an inherently dangerous affair of the heart, played out on the white sandy beaches and clear blue waters of the Cayman Islands. They were deeply knotted to each other till death do they part. Although time and tide may wait for no man on ocean waters; love and hate may clash and explode on troubled waters; all that glitters may not be gold in paradise, yet pain and agony may cease to exist only in their wildest dreams. Georgia smiled at her mom and Jared kissing as she walked out of the house. The kiss was long, passionate and gross; but she knew Jared was right for her mom. He made her happy like never before. They wouldn’t end the kiss. Other things were also happening. Georgia quickly realized that this stuff was not for kids. One thing led to another and from dust to dawn was a twilight night. Find out why evil triumphs in twisted love, when good women sit idle and do nothing. Born in the former British colony of the Gold Coast, I grew up in the tiny canoe-fishing village of Christiansborg, in the picturesque serenity of the Coconut Grove community by the gates of the infamous Christiansborg Castle. A thriving neighborhood located under the vast array of tall and lanky coconut palms that spread along the white sandy beaches and clear blue waters of the Atlantic Ocean. I am now a proud American with a beautiful wife, two wonderful children and two amazing grandchildren. I came to America to fulfill my dream of college education and if all goes well, maybe get to experience the American Dream. 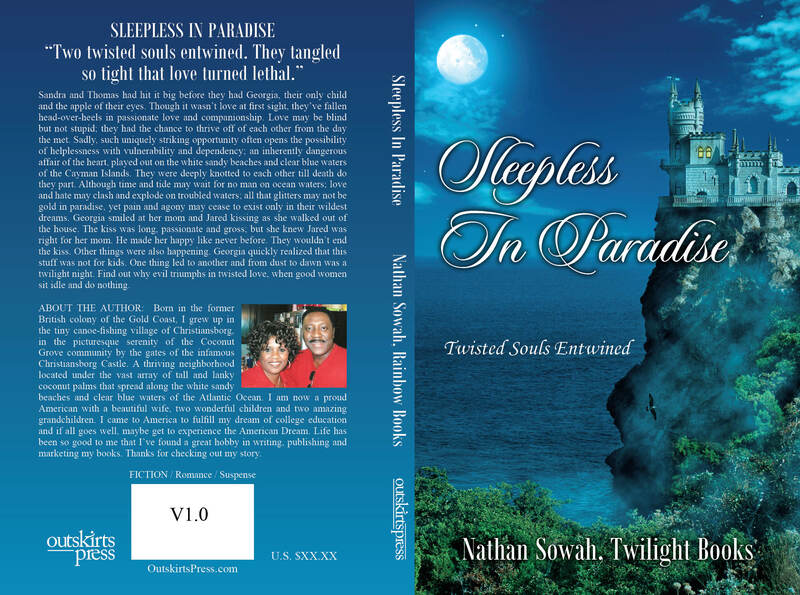 Life has been so good to me that I’ve found a great hobby in writing, publishing and marketing my books. Thanks for checking out my story. Please take a look at two possible covers below and then vote on the choice you recommend for Nathan. 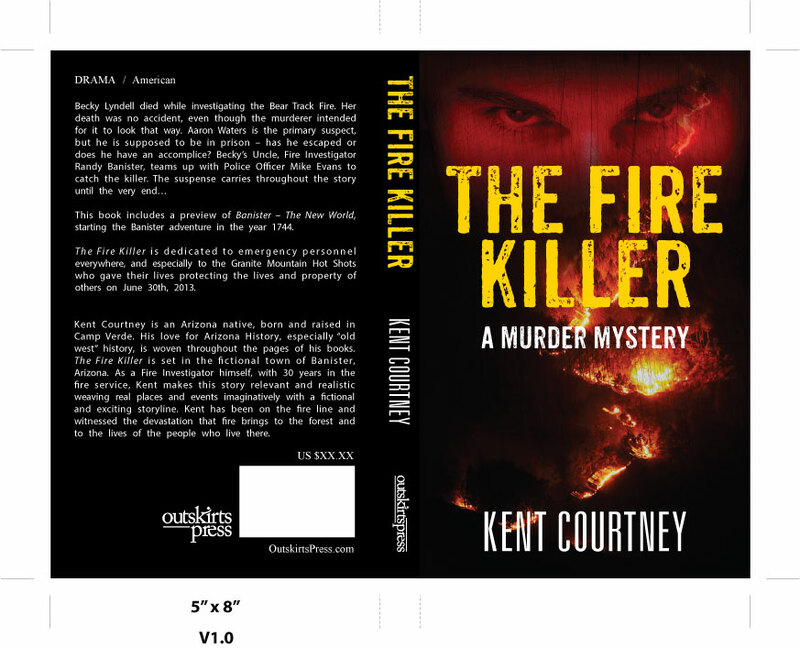 Kent Courtney is self-publishing a book with Outskirts Press. And he wants your help deciding his book cover. the murderer intended for it to look that way. Aaron Waters is the primary suspect, but he is supposed to be in prison – has he escaped or does he have an accomplice? Becky’s uncle, Fire Investigator Randy Banister, teams up with Police Officer Mike Evans to catch the killer. The suspense carries throughout the story until the very end. This book includes a preview of “Banister – The New World,” starting the Banister adventure in the year 1744.”The Fire Killer” is dedicated to emergency personnel everywhere, and especially to the Granite Mountain Hot Shots who gave their lives protecting the lives and property of others on June 30th, 2013. Kent Courtney is an Arizona native, born and raised in Camp Verde. His love for Arizona History, especially “old west” history, is woven throughout the pages of his books. 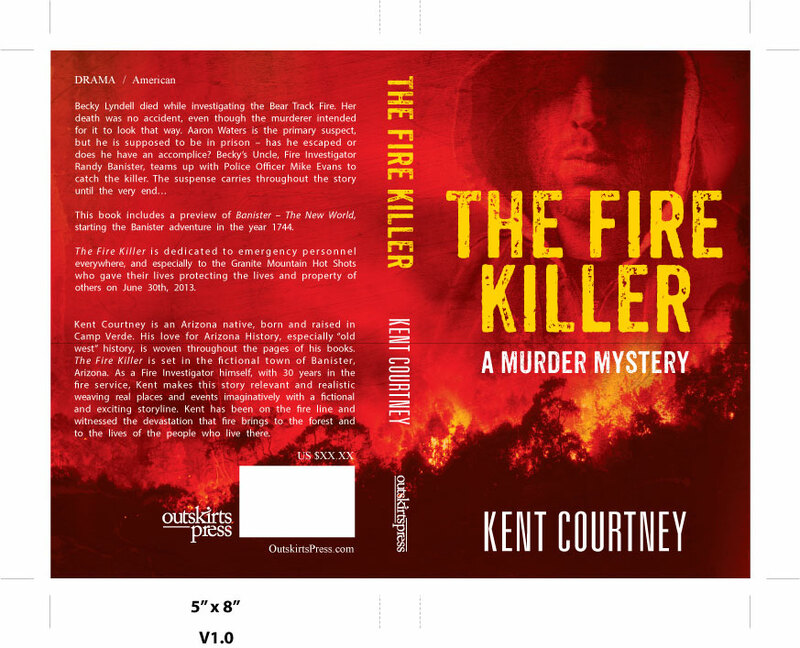 The Fire Killer is set in the fictional town of Banister Arizona. As a Fire Investigator himself, with 30 years in the fire service, Kent makes this story relevant and realistic weaving real places and events imaginatively with a fictional and exciting storyline. Kent has been on the fire line and witnessed the devastation that fire brings to the forest and to the lives of the people who live there. Please take a look at two possible covers below and then vote on the choice you recommend for Kent.